Download Wacom Bamboo CTH 460 Driver For Windows 10/8/7 And Mac Digital drawing And Graphics tablet Free. Bamboo Pen and Touch combines the benefits of Multi-Touch with the comfort and precision of Wacom’s ergonomically-designed pen, giving you a powerful new way to work with your computer. Multi-Touch allows you to use simple gestures and finger taps in an area larger than on standard mobile devices or laptop trackpads. Easily move around your desktop, scroll through documents, navigate the web, zoom in and out of photos, and rotate images. For precision work, pick up the pressure-sensitive pen to edit photos, create personal greetings, make sketches, and mark up documents in your own handwriting. The tablet’s generous active area makes it more natural to use. It’s easy - even if you’re new to the touch experience. You can even customize your Bamboo Pen and Touch experience by assigning your own shortcuts to the four ExpressKeys. Bamboo Pen and Touch works with your existing computer: desktop or laptop, PC or Mac. And it’s an incredible value with the included software: Adobe Photoshop Elements and Nik Color Efex Pro. Sleek and black, the tablet makes for a stylish addition to your workspace. Attach Bamboo Pen and Touch to a standard USB port, set it comfortably by your keyboard, and let your intuition guide you. 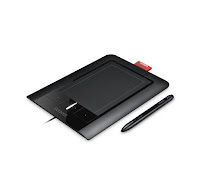 I will install Wacom Bamboo Fun CTH-461 on Mac OSX El Capitan version 10-11-6 but can not find the driver. Help me please. I found that the WacomTablet_6.3.21-3 did not work well on windows 10 version 1709 with my Bamboo touch and pen CTH-460. What worked for me was to unplug, uninstall, reboot, run pentablet_5.3.5-3.exe and then replug. I think that driver is still available somewhere - I have archived a copy. Thank you George. This version works fine on windows 10! @george saridakis thanks bro you are real mvp!